When you are a startup or starting a new business, cash becomes the real challenge that point of time. Any free services can really be a life saver to help get things moving forward. One of the critical parts in any startup or enterprise is the communications. And no one can ignore the importance of email is the entire communication cycle. 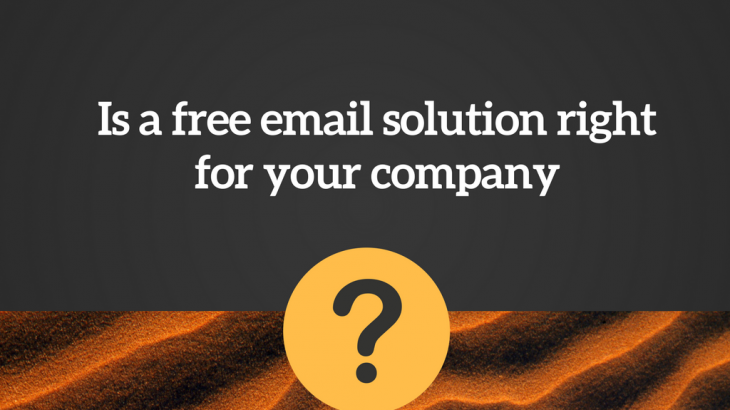 Here are the 6 reasons of consideration: Is a free email solution right for your company? Security—Cybersecurity especially ransomware, email phishing and email spoofing are causing major business losses currently. If you’ve experienced a security breach—or are even worried about it happening—you need a more sophisticated solution that offers increased, enterprise-class security capabilities. As a startup, you can’t afford to be at loss at the initial stage. Tools—Free email tools don’t typically provide better user management and inbox with search tools. Paid email solutions offer a range of features to spend less time managing your inbox and more time managing your business. Domain names—Using a custom domain for your business email is a crucial way of business looks professional. For example, “yourname@yourcompany.com” has a lot more credibility than “yourcompany@freedomain.com.” Free custom email addresses are available, they often open to security threats because they will likely have access to your data and other information. Data—Often, when you agree to free email terms, you are giving the email provider permission to your data and send you ads—which is how their companies earn while offering free services. Not only can this distract from your work, it also puts your company’s data at risk. File sharing—If you need to share files and collaborate securely with your team? Paid email solutions enable team-based collaboration and sharing without putting confidential company information at risk.